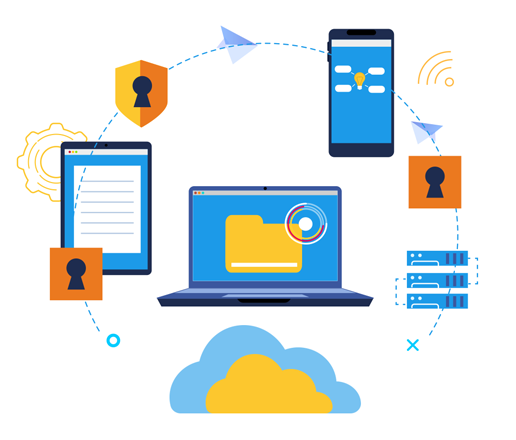 A cloud file transfer or cloud data migration service like CloudFuze helps business users or consumers switch to a new cloud vendor without worrying about the complexities involved in migration. Unlike consumers, enterprise users must spend a lot of time researching the migration providers to ensure they end up choosing the right one. Why does anyone need to pay to a company when they can download all their data to their local machine and upload it to their new cloud storage account? Here is the answer. Manual migration moves only files and folders to a new cloud storage account, not users and permissions. Hence, the manual cloud storage migration is least useful for those who need to transfer users along with files. The manual approach comes in handy only when migrating a small amount of consumer data, which consists only of files and folders. When it comes to migrating terabytes of data (files) or enterprise cloud storage accounts (users, files, and permissions) software-based migration is the only viable option. Now, let’s look at the five essential factors one must consider before signing up for a cloud file transfer service. Cloud file migration software needs access to both your source and destination clouds to transfer files. Leading cloud file migration providers like CloudFuze use OAuth protocol for accessing their clients’ cloud data. OAuth provides limited third-party access to third-party migration specialists, thus ensuring the safety of personal or enterprise data. Besides OAuth, several other aspects like data center integrity influence secure file transfer over the internet. Take a look at how CloudFuze handles data security to get an idea of how security works in this domain. Most cloud migration providers claim that migrating data through their app is easy as pie. In reality, it isn’t. There are a number of a migration project can go wrong, resulting in project delays or even data loss in a worst-case scenario. Companies that are in this business for a long time understand the roadblocks and risks better and can help enterprise users switch to a new cloud service without hurdles. 3. Does the Company Provide Dedicated Enterprise Support? Most cloud file transfer providers on the market are SaaS-type companies. As a user, you are expected to handle migration on your own. Since only a few companies like CloudFuze offer prioritized support, you need to find your comfort zone. If you an enterprise client with hundreds of users and terabytes of data to move, we recommend that you go with a company that specializes in enterprise migrations. 4. Does the Company Support Leading Cloud Services? Another critical thing to check for in a cloud data migration service is its ‘connector’ support. A connector is nothing but a cloud service like OneDrive, Dropbox, Box, etc. If you wish to migrate from Dropbox to OneDrive (personal or enterprise), the migration provider must support both. CloudFuze, for instance, supports over 40 cloud services including NFS. Companies like CloudFuze that deal with enterprise clients predominately are flexible when it comes to pricing. As a business user, you wouldn’t be forced to pay a standard fee per user or GB of data transferred. If you need to move hundreds of users and TBs of data, choose a company that provides you a customized quote. Besides, always try the product by yourself or request a demo before choosing a migration partner. How to move files between Google Drive and OneDrive (previously SkyDrive) accounts? How to transfer files from FTP to OneDrive(OneDrive Business/ Office 365) accounts? How to Transfer Files from FTP to Google Drive/Google Drive Business?